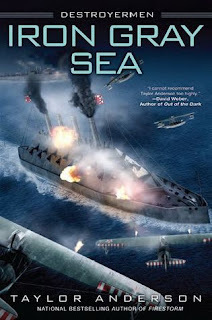 Destroyermen: Iron Gray Sea by Taylor Anderson is the latest installment in a series that proposes an alternative history for World War II. The book is richly imagined, with the sort of detail and authority that Anderson has brought to all of his work. As a gunmaker as well as a forensic ballistic archaeologist, Anderson speaks from a position of knowledge and enthusiasm for the subject matter that makes the story not only authentic, but also far more exciting. Anyone looking to jump into a series like this should start at the beginning, given that this is nowhere near the first book, and a great deal has happened. For anyone having trouble keeping track of exactly who is doing what, Anderson decided to include a character list, which some may find handy to refer back to as they read. With such a vast canvas to cover, Anderson has several story lines that run parallel to each other. He pays equal attention to all of them, which gives the reader the perspective of not only the nominal 'hero' of the piece, but also opposing viewpoints. This is a wise choice, as there are always more to a war than 'good guys and bad guys,' as Iron Gray Sea proves. Among these threads are the former IJN Command, or "Lord" Sato Okada's search for the destroyer Hidoiame. Matthew Reddy and his sweetheart Lieutenant Sandra Taylor have plans of a matrimonial nature, and the now Commander Alan Letts continues to tinker with the development of new weapons. In the meantime, the alliance attempts to launch an offensive attack in the Indi-aa, all the while the 'other side' plots their own attacks. Among them are the "General of the Sea" Hisashi Kurokawa, and the Grik, who find assistance from General Halik. And all the while, the Holy Domininion plot and scheme, and numerous other traitors add their plans to the mix. There were only several places in which Anderson didn't quite carry off the book, and those were in the wrapping up of several threads, as well as the fact that it felt as if he was perhaps trying to cram too much into this volume. Aside from those quibbles, the book is a robust read, with interesting characters, and a plot that will keep one turning pages to find out what happens next.